Today we’re going to be looking at one of the hottest mechanical gaming keyboards: Razer’s new Blackwidow Chroma. The keyboard features fully customisable RGB backlighting, as well as Razer’s custom Kailh mechanical switches and a host of extra features. Ebuyer were kind enough to set me up with the new keyboard, so let’s get right to the review! * These switches are weighted at 50g and 45g and equivalent to Cherry Blue and Brown, respectively. The major difference is the actuation point, which is 0.3mm sooner than on Cherry’s switches. I have not seen any keyboard science to suggest the difference is at all meaningful. Razer is one of the strongest brands in gaming, and that is immediately clear from their packaging design. The box is made from strong black cardboard, with the requisite Razer logos in their trademark green colour. The front of the box shows off the keyboard’s biggest new feature: that Chroma backlighting, capable of displaying a wide range of colours. There’s also a cutout for the cursor keys, allowing you to try the keys before buying them in-store… not much help if you ordered them from Ebuyer, but there you go. The back of the box is more detailed, offering explanations of the Razer branded switches inside, the extra macro buttons and other features of the keyboard. Inside, the keyboard is well packaged to survive the journey to your house. The Blackwidow Chroma comes with the standard literature and some Razer stickers to adorn your PC, car or inattentive younger brother. Now let’s move onto the fun part – taking a look at the keyboard itself! 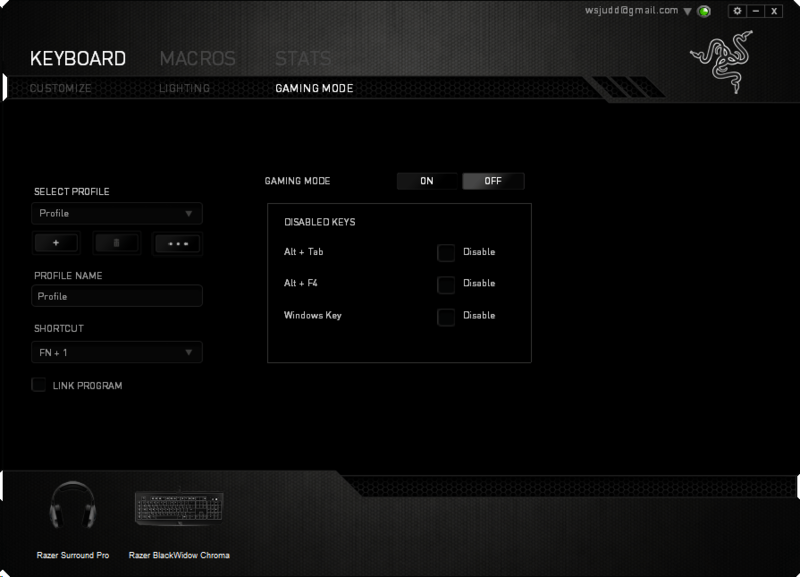 …and a column of five macro keys along the left hand side. 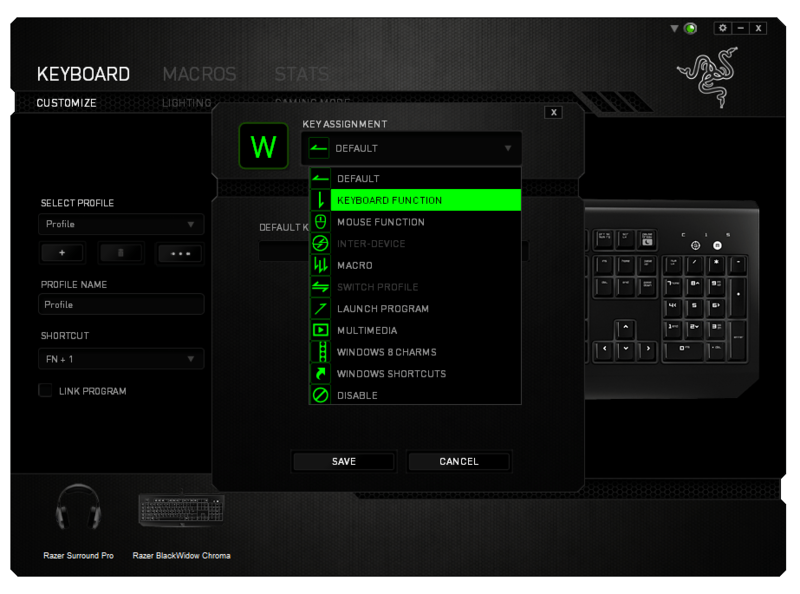 The function keys on the left hand side can be used as media control keys with the Function key in the lower right, while the right-side keys on the function row control additional features: macro recording, gaming mode, LED brightness and sleep. 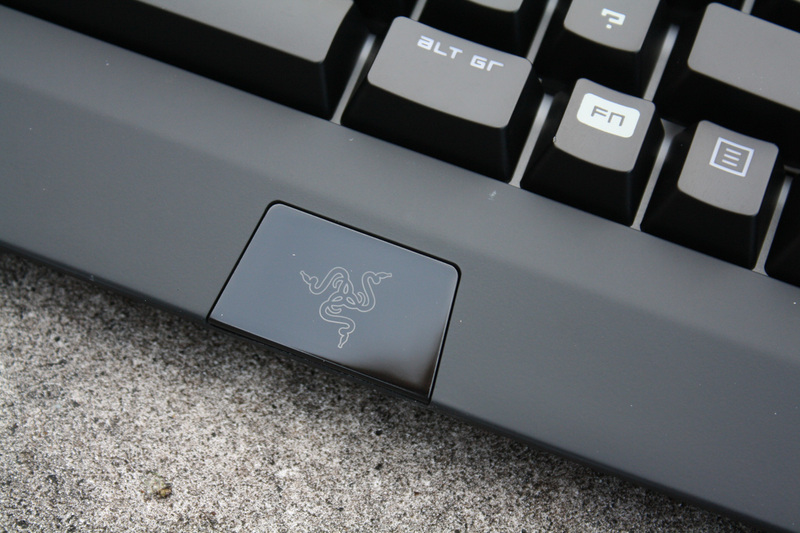 Below the keys, we have another design element – a Razer logo, which we’ll see backlit in various colours later. 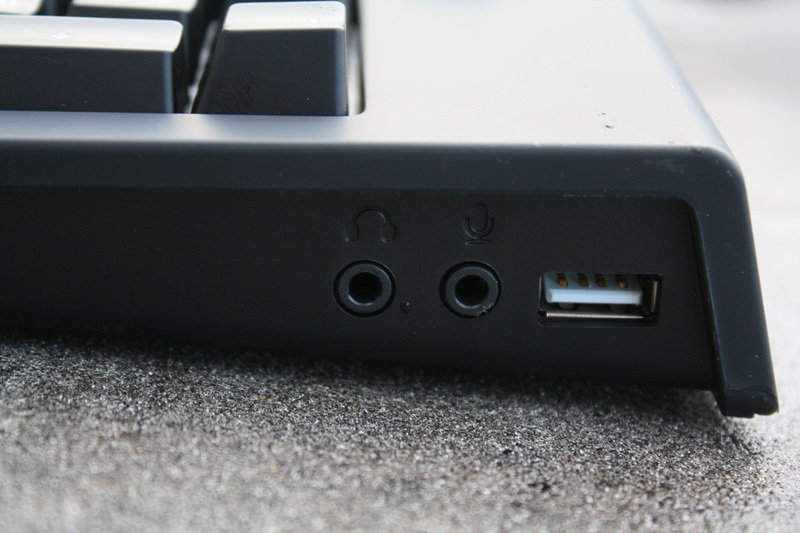 On the right hand side of the keyboard, we have the passthrough ports: one USB, one audio out, one microphone in. Having these ports means that only one cable need run from your standard three peripherals – keyboard, mouse, headset – to your PC. The placement to the right hand side is a little unusual, as we normally see these ports on the back. The left-side placement works to a degree (for right-handed users), but it does infringe upon the mousing space of right-handers and is really inconvenient for left-handers. These join up with the golden plugs at the end of the keyboard’s well-braided cable. The bottom of the keyboard is also quite ordinary, with the usual logo in the centre and a quartet of rubberised pads to stop the keyboard sliding around your desk (although the considerable weight of this keyboard will also help that aim). There are two legs to flip out if you prefer your keyboards at a slight angle. 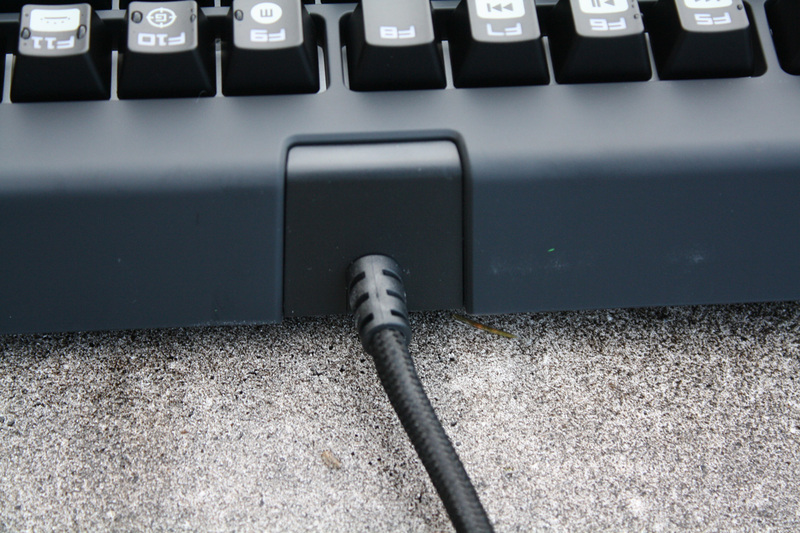 The final piece of the puzzle is the back of the keyboard; here we see the braided cable joined to the body. With that, we move onto the other half of the equation – the software that give this keyboard its special features. 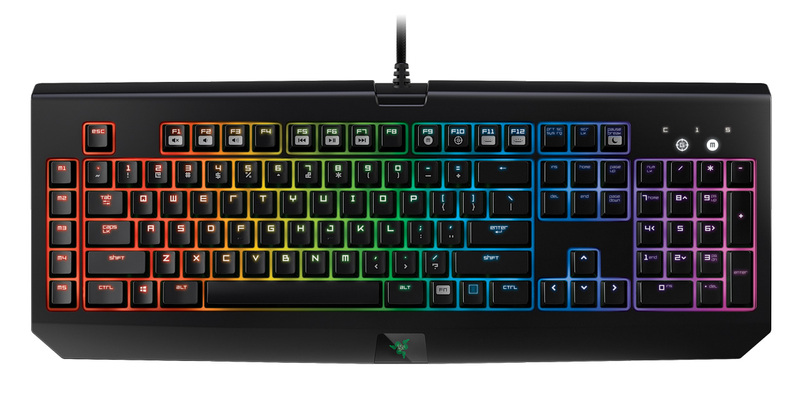 The Chroma uses Razer’s Synapse software to control its performance and lighting. 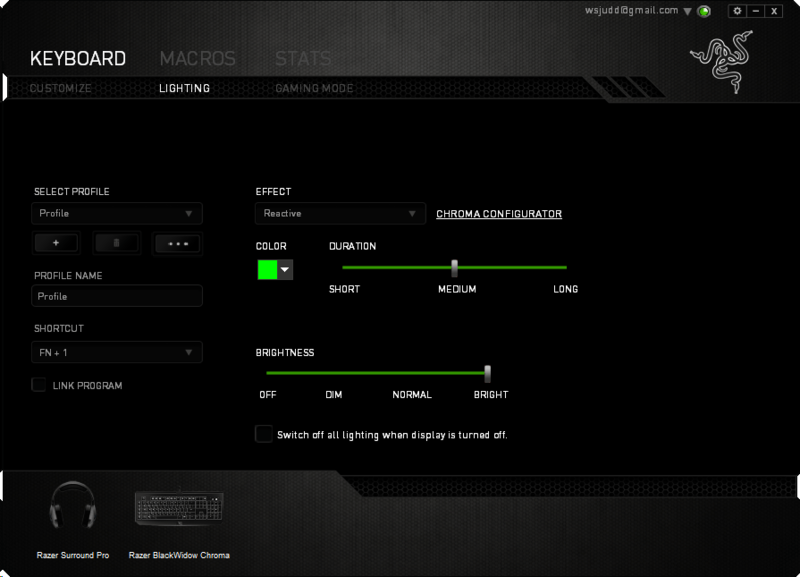 To get a taste of the software, I highly recommend Razer’s Blackwidow Chroma page, which simulates the various modes available. Spectrum cycling mode is the keyboard’s default, which simply slowly cycles through a full rainbow of colours. Reactive mode is another cool one, leaving keys lit in the colour of your choice for a few seconds after they’re pressed. The effect isn’t that practical (as it means keys are never lit when you need to press them), but it certainly does look cool. Ripple is another take on a reactive lighting mode, but this time any pressed keys with produce an effect like a ripple on a pond. It’s quite beautiful, even with only one custom colour used. Static is relatively boring, keeping the keyboard lit in the colour of your choice. You can choose one of forty prepared colours, or use the Windows colour picker to choose your own custom shade. Custom is the final mode, and as the name suggests it allows full customisability of the colour of each LED in the keyboard. For example, you might choose to light up keys used in a particular game in various colours, and indeed there are pre-made options for genres (shooter, MOBA, MMO) and specific titles (CS:GO, SC2, DotA 2). The interface for changing modes and choosing colours is quite simple, although it faces some of the same accuracy concerns as the Excalibur RGB when you’re using the Windows colour picker to choose custom colours. The custom mode is necessarily more complex, but it still is easy enough to use and a brief tutorial is even provided. The custom mode is powerful too, with support for multiple layers and automatic switching as programs start. The performance side of the Synapse software is also fully featured. 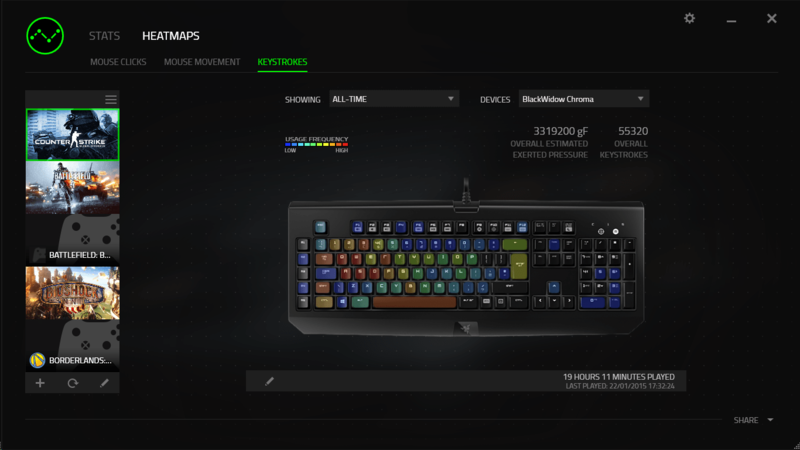 While mice tend to get more interesting and varied controls, for keyboards like the Blackwidow Chroma you can remap each key on the keyboard, record and set macros, and set modes to be activated automatically as games or apps are launched. There are even stats and keystroke heatmaps recorded while using the keyboard, divided by game. 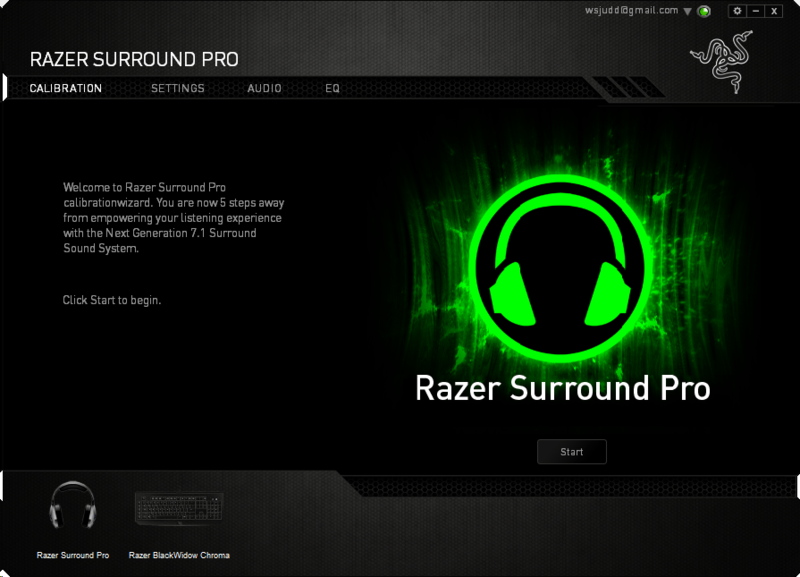 The same Synapse software is also used for other Razer gear like mice and headsets, as well as the Surround Sound Pro software that provides a simulated 5.1/7.1 mix to stereo headphones. It’s convenient to control multiple peripherals from a single location, and there’s no long switching times between devices as with the Cougar 700M and 700K. In order to put the Blackwidow Chroma through its paces, I used it as my go-to keyboard for a period of about two weeks. During that time, I played a lot more Counter-Strike than I should have done, wrote quite a few articles and even used the Chroma to impress people at parties (yes, I’m irredeemably nerdy). Here are my findings. As a gaming keyboard, the BlackWidow Chroma seems a strong choice. While most of the backlighting modes don’t provide much help over a standard setup in which all keys are lit, the custom mode does allow you to light up only the keys you need to use. That won’t be of much help to a master, but it is a nice thing for a beginner. Otherwise, the BlackWidow Chroma is as solid as past Razer keyboards in this area, ticking all the boxes: macros (including dedicated keys and good software), game mode (locking Windows and other potential key combos that take you out of the game, and solid mechanical switches that will stand up to abuse and provide much more tactile and aural feedback than a typical rubber dome. Which switch is best for you is largely a matter of taste; the clicky option gives more feedback but requires more force, while the tactile option doesn’t provide as much resistance. Overall though, I can’t fault the BlackWidow Chroma as a gaming keyboard. Writing is another traditional strong point for a mechanical keyboards, and true to form the BlackWidow does not disappoint. The Kailh switches used here aren’t as well-known as their Cherry brothers, but they do provide a good response and sound brilliant when you’re typing at high speed. There is something ennobling about typing on a clicky mechanical keyboard that makes you want to keep writing, and that’s present and correct here. The Chroma is the first mechanical keyboard I’ve had that’s actually attracted attention at a party. I use that term lightly, but having the Chroma set to Wave mode legitimately prompted a lot of questions from those in attendance – what other modes does it have, do the colours mean anything, and why do the keys make that weird clicking noise. A few people got quite into it, trying out all the modes and choosing a favourite (for many, it was wave mode… for others, ripple or reactive modes were better). The Razer BlackWidow Chroma is the best Razer product I’ve used in years. The RGB backlighting is everything I hoped it would be and more, and the rest of the keyboard doesn’t disappoint – the construction is solid, the added features work well, and the switches feel as good as the Cherry switches used previously in Razer keyboards. While the keyboard is expensive and takes up considerable space on your desk, the Blackwidow Chroma is well worth it.